Well, my last night patrol in the garden was uneventful. No slugs and this morning no damage, not even from the mouse, which I decided not to trap after all. Its raining heavily this morning – why am I going to Glastonbury?! Ah well, the die is cast. I’ve made up a new word: Slugduggery. Noun: to use one’s guile against garden molluscs. I’ve been wondering what to call the underhand unscrupulous but necessary pursuit of gastropods and now I know. Tomorrow I’m off to Glastonbury so my slugduggery will have to be kept on hold. As I leave I’m also conscious that the mouse that had whipped off the top of a small row of carrots has now moved on to its second course: the beetroot. You spend all your time worrying about slugs and a mouse slips in under your nose. This is a real test for me because by nature I prefer life to death and traps are not that easy to use. Because traps are indiscriminate you have to set them up under some sort of protective cloche or wire to keep out other creatures like birds, frogs, toads and so on – although how can you ever guarantee to get your target and nothing else? But the garden is looking bereft and incomplete without the fluffy little tops of my carrots and in my absence I don’t want it to become any less gorgeous or productive. I am after all in this to grow crops. 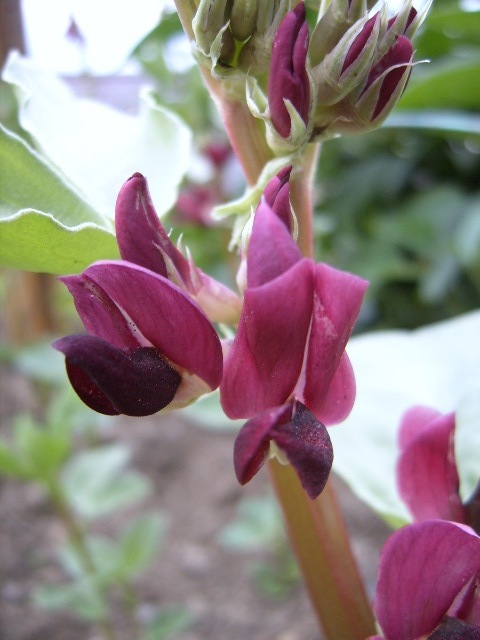 My crimson flowered broad bean plants have started to bloom and look fantastic. I’ve planted them on the recommendation of Chloe Ward. They’re a Heritage Seed Library bean so it’s good to help keep them alive. Before I go away I’ll be making some fresh comfrey piles and recording one more slug watch tomorrow morning. The last few nights have been fairly quiet for slugs. They didn’t even seem very active on the comfrey piles. But the garden still has lots of suprises. Last night there were plenty of moths flying around. I’m a great fan of moths, they are truly beautiful and amazing creatures and only a small handful of the hundreds of moths that are likely to visit our gardens are bad for them. Amongst these are the pea moth. These are active during June and July and if you’re peas are flowering now you should look on the pea leaves for small flat eggs laid singly or in clusters. These hatch out into caterpillars and eat their way into the pods to eat the developing peas. It’s very difficult to get rid of them once inside the pea pods. The best way to avoid them totally is to plant early or late so they are not in flower during June and July. This was impossible for my garden because it wasn’t ready for planting in time. Tonight I’m going to be checking my pea leaves. I don’t consider it a chore. It gets me outside and it’s a lovely evening. I’ll also be cutting some more comfrey, both to keep the slug piles topped up – and for the compost heap – and putting in some larger pea sticks to keep up with pea tendrils. Lastly, I’m afraid, it’s probably going to be the mouse-trap. Urgh! Oh, while I remember here’s the picture of the snail eggs. 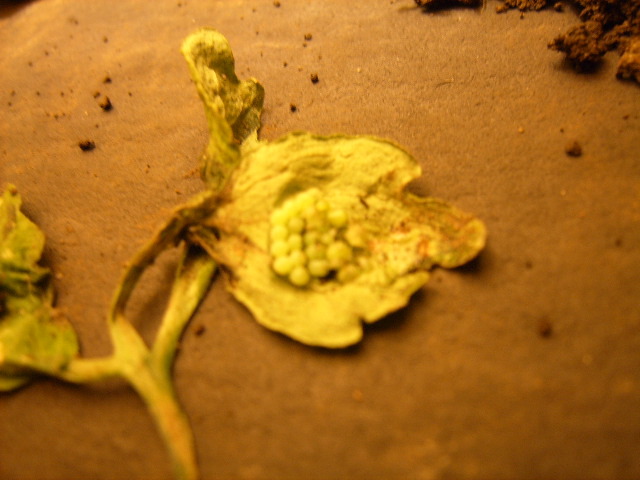 And one of some caterpillar eggs. Someone visiting tonight will be visitor number 10,000 to the blog. Some of you may have been looking for US astronaut Alan Shepard but I’m going to claim you for my own! I may not have shot a golf ball round the moon but I did grow some very nice spinach. Please take a few moments to enjoy the site. Thank you for coming and when you do leave, be back soon. Nothing particularly new. Went up to the garden and removed about fifteen slugs and snails from different parts of the garden. The heavy rain has definitely made conditions more hospitable for the slugs. There were more slugs and snails on the comfrey but it doesn’t do a total job. It was about one o’clock in the morning when I went up there. I did find a toad up there again so they’re still active. The good news about the rain is that the plants are really starting to grow much quicker. The plants race against time to become so established occasional slug damage is not a problem. Mmh. Be careful what you wish for. I asked for rain. I asked for slugs. I asked for snails. I got them all. Last night was interesting. It was clear and cold, and droplets of water clinged to the edges and tips of leaves like pearls pinned to a forest tapestry. The tips of the leaves of the poppies had turned upwards towards the moon and the pearls seemed like they were being pulled out of the plant, and would any moment rise like bubbles in to the night air. Ah, the magic of the slug hunt. It prepared me for anything else that might follow. I didn’t go up to the patch the night before and I really paid the price. In the morning I found a slug walking away from two small, and now even smaller, defoliated poppies. Not a great loss but I think if I’d been more vigilant I probably could have removed the slug. There was also some small damage to the leaf of a bean plant, which was touching the dry rubble wall. Obviously an opportunistic slug. The worst of it though was a small row of carrot tops: gone. Now this was a bit unexpected and at first I put it down to the fact that there wasn’t any comfrey in this part of the garden…until…I looked more closely and noticed a trail of wasted carrot tops heading towards a gap between the dead hedges: mice! There’s a mouse hanging around my compost heap at the moment so its probably the same one. How do you deal with mice? Any ideas? You can mouse cage plants but you need a fine mesh to keep them out and I haven’t got any. Nor do I have traps. And I wont use poison. Anyway, I’ll re sow that line with something else and hope the other row of carrots survives. So after being lazy the previous night last night I made a real effort. I’d already located the bean eating snail and three others wandering around and moved them to a different part of the garden when I noticed a snail that just seemed to be sitting on the soil. I tugged at it thinking it would come up easy but I felt some resistance, and the most amazing thing happened. It gave a little cry. When I shone the torch down I could see that the snail had deposited a little cluster of eggs about 1cm underneath the soil. Perhaps it was halfway through the lay. If I had known I would have stopped and watched before lifting the snail. As it was, I’d found my first batch of snail eggs. They fascinated me. I lifted them all out, placed them on a piece of slate and brought them down to the house to take photos. I will upload them at some point but there’s something strange going on with my camera at the moment and I couldn’t get them on to the computer. 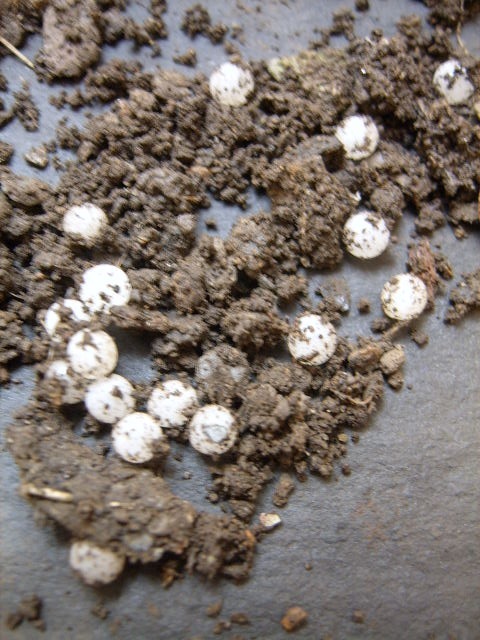 The eggs also look like pearls, but very small ones. Perfectly round and white. They actually look quite special. Yesterday I also found a leaf with some butterfly eggs on and I’ll put that picture up as well. Good for identifying cabbage white problems. Anyhow, the discovery reminded me why hoeing is such an important part of the process, to disturb as many as the eggs as possible. I found about twenty eggs in the cluster, and who knows more could have been on the way. Slugs can reproduce at a fantastic rate. Hand picking really seems to work too both for identifying problems and for actual removal. Going up there this morning there’s no more damage. Its raining loads at the moment so we’ll see what tonight brings. Unlikely as it might sound to some people there’s a big gardening presence at Glastonbury and this year I’m going to be doing at least one composting workshop and a reading from my book Curious Incidents in the Garden at Night-time. Glastonbury boasts a permanent forest garden in the Green Fields, which has grown more bountiful each year, and hosts a number of gardening talks. It also provides an opportunity to get away from festival glare and relax in a nice environment. Glastonbury is part joy part survivalist weekend and its amazing to have a place to go that’s really peaceful. There’s another great garden in the Greenpeace field designed by friends Jenny and Medhi and that’s where I’ll be. Not sure what time I’m talking but if you are going to Glastonbury then come to the Greenpeace field and check the garden notice board. I’ll be with seven people from the Centre for Alternative Technology and we’re going to be sharing a space with The Soil Association, Garden Organic and Practical Action so there’s going to be a lot of great people to talk to if you want more information and advice about being green. This does mean that from next Wednesday there will be a temporary hiatus with slug watch although if I can get to a computer I might post from the festival. Well I didn’t quite make it to midnight but I’ve just seen a sight to gladden any gardeners’ heart. Two frogs crawling around my lettuce patch. There’s something very reassuring about watching an amphibian push through a line of rocket leaves. And the fact that there are loads of slugs eating comfrey but none eating Allan’s vegetables. I might go up there again later but at eleven o’clock slug watch is proving satisfactory.